I was in London at the Excel exhibition centre in a hotel in its “ ghost land “suburbs. With a few hours to kill before bedtime I searched for a pub showing BT sport. Immediately recognise the Queens head from previous searches. Just a short walk from Limehouse DLR, great real ale , friendly staff , pleasant locals . Just fresh made rolls , pork pie slices for food, but hey live footy, great ale , nice atmosphere- heaven. Will be back tomorrow and add the fresh rolls to the wonderful pint. OK so I like some craft beers but most if them, frankly taste like dish water. So the Queens Head is a "proper pub" for the locals. Nothing special just a decent pint, friendly staff and the locals talking to each other. I love this pub, it is a traditional old boozer with great staff and the best landlord ever. Great selection of beers and drinks at great prices. They have a well stocked juke box, show live matches, and on occasions have a comedy show on selected Tuesdays which is hilarious. 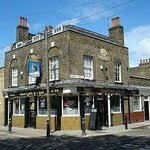 A real traditional local boozer in an undeveloped East end square in the heart of Stepney. Try and go on the Quiz Night. Great local pub in middle of Limehouse. Jack and Denise have done a great job in making the Queens Head a warm, pleasant pub with regulars, locals and tourists all welcome. Lots of different ages and types of people come in. Bar staff are friendly and efficient. There is no food, just crisps and nuts. But you can order in pizza etc. Great selection of well kept beers. Wine not bad either. There is a darts team, quiz night on Thursday which is awesome entertainment. There are regular comedy nights and music. Dean Friedman even played there ! There are guest rooms if you want to stay over. Much cheaper than the Grapes and less poncy than the Narrow. A real east end type pub. No river views but a patio at the back with a bbq. BBQs held occasionally. Grey location for the London marathon ! Excellent juke box that plays practically any record you ever heard. Been to Queens Head? Share your experiences!